So Day 1 in Paris was all about settling in and spending some quality time with a friend. Read about it in Day 1 in Paris. After a good night’s sleep, we had a hearty breakfast of eggs, rosemary and garlic potatoes, toasted bread with cheese and some grilled mushroom all prepared by the husband and I. We also packed some cheese and tomato sandwiches to take with us for our trip to Musée du Louvre or the Louvre Museum. I was very excited to be finally visiting the Louvre that I had heard and read so much about. Remember Da Vinci Code? So after navigating through the Metro, we landed outside The Louvre which is situated on the right bank of the Seine river. It has 3 entrances and this is the one we took. The elder son who is quite a history buff was very excited to visit the various galleries. We had taken a skip-the-line ticket but the crowd was thin on that day and we didn’t really need it. Once inside, we hired some audio books. Without these, you really will be at sea. The audio books reminded me of the old gaming console and were quite intuitive in terms of the layout and lead you to specific galleries that you wished to visit. So off we went. The sections were massive, and we started with the Artefacts. This section houses over 50000 pieces dating from 4000 BC to 4 AD. Some other sections that we enjoyed were the Greek, Ertruscan and Roman Department, Islamic Art which also showcased some of the artifacts from the Indian subcontinent. The sculptures were well preserved and truly awe inspiring. The rooms were large and most had comfortable seating where you could plop down and admire the artefact/painting while listening to your audio guide. The paintings section has over 7500 paintings including the world famous Mona Lisa that everyone queues up to take a picture with. Since it is behind a glass wall, you can only click a picture from a distance. Though the experience of seeing her wasn’t very nice with all the teeming crowds but you can’t possibly not see the most famous painting in the world. But there were so many other paintings that would take your breath away. Noisy visitors who were only interested in taking selfies with all and sundry paintings do mar your experience but I guess that is how the tourists are these days. She was arrestingly beautiful with her face and eyes almost seeming to speak. Louvre Museum is housed in the Louvre Palace, Paris. The gorgeous Pyramid which invites many visitors has a large shopping mall underneath it that we just skipped through as we went out. We did spend some time outside the Pyramid. Despite spending the entire day and clicking innumerable pictures, this museum spread over 14 kms. and 3 sections had its large parts uncovered by us. Maybe, some day we will go back again. For now, our minds were astounded with the sheer variety of beauty and talent that we had seen unfold. It was a long and beautifully spent Day 2 in Paris. 14 kms of Museum. I will be in Paradise then. Over 7k paintings… It would take days to go through all of them. I have seen pictures of crowd near the painting of Monalisa. I don’t I will ever be able to enjoy an artwork in such crowd. But then I really hope I get to visit it soneday. Your breakfast sounds delicious ? 14 km of museum? That must be massive! Such beautiful paintings you’ve captured on camera. I’ve been fascinated by Paris for a long time. Europe, actually. Wonder when and if I will ever go. Paris! Ahh I love Paris. And I loved every bit of my time there. Louvre is huge and you really need a lot of stamina and passion for arts to cover every corner of it. It’s fascinating really. The sheer beauty and scale of it. Louvre has been on my bucket list since ages. I love arts and the history behind them. I’m planning a visit to France some day soon. I’d better wear comfortable shoes for my visit to this place. Good to read about your experience at the famous Louvre. Though it may not happen anytime in the near future I would love to experience what Louvre offers in terms of all that beauty of sculpture, painting and history 🙂 As much as I enjoy art, I also have some reservations about what the whole “museum culture” has done to living cultures in many parts of the world. At the same time I also wish we in India learn some lessons on how to take care of and preserve our artistic heritage, which also includes developing excellent institutions like museums that can be educative and play an important part in our educational curricula! Oh by the way, I had read somewhere that the Monalisa on display there is not really the ‘real’ one (the real one is kept elsewhere for safekeeping). Is this true? Thanks for giving this brief tour of Louvre! We walked around the Louvre for two days, but it still seemed like not enough time. I wonder if 2 months would be enough. Lovely snapshots and descriptions, Rachna! Wow! those works of art! I know what people mean when they say that a visit to the Louvre can be very overwhelming. Did you say 14 kms? Whoa!! Thank you for the sneak peek, Rachna. ? 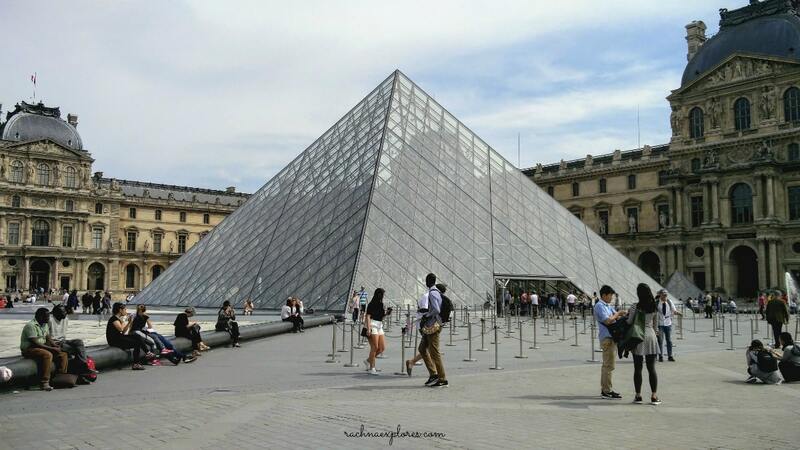 I have been fascinated by the Louvre ever since I read about it in the Da Vinci Code. What a beauty, with all those artifacts and the paintings, would surely love to visit it someday. Never had an idea that it’s spread in such a huge area… truly a unique marvel in its own right!